Eagle Pulleys and idler, the ultimate upgrade now available! Our Enduro bearings pulleys for the Sram Eagle 12-speed system have been completely re-designed to increase shifting performance, and reduce overall friction. We start by machining aluminum centers that are 30% larger than a standard bearing pressed in to a plastic pulley wheel. 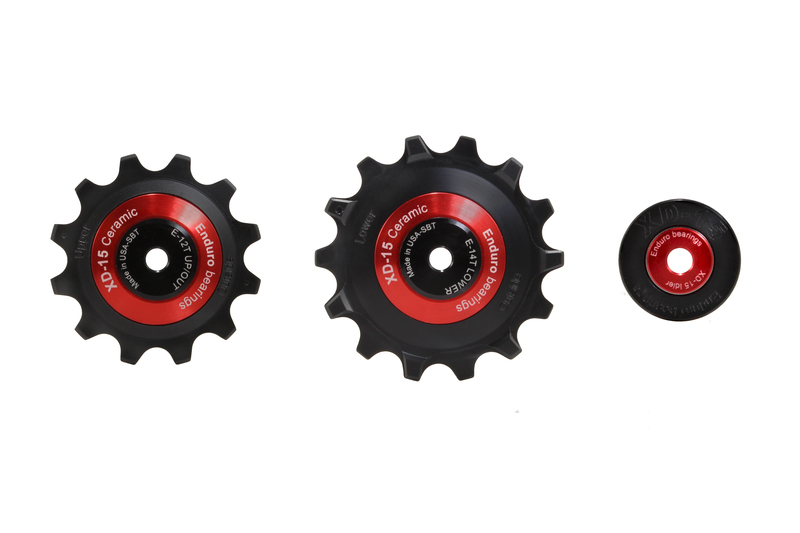 The aluminum centers increase the overall stiffness of the pulley, translating into faster shifts with no lag and more precise shifts to the desired cog. 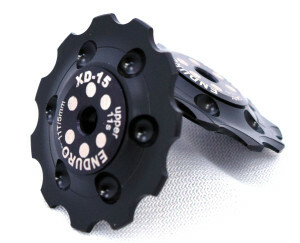 XD-15 bearings are housed within the aluminum centers. Each upper and lower XD-15 bearing differ and are specific to their separate duties for less friction and improved shifting performance. To reduce chain friction the pulley teeth are machined from 500 AF Delrin® with Teflon®, offering significant less drag than pulleys manufactured from aluminum or titanium. The overall smooth profile sheds mud and debris, providing easy clean up after riding in less than ideal conditions. Our shift cable idler replaces a plastic roller and bushing with another XD-15 bearing. The design of the idler reduces shift friction by a noticeable amount, especially shifting up to the larger cogs that see teeth differences between 6 to 8 teeth between cogs. 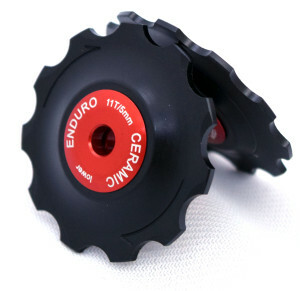 The ultimate jockey wheel with Enduro XD-15 bearings. 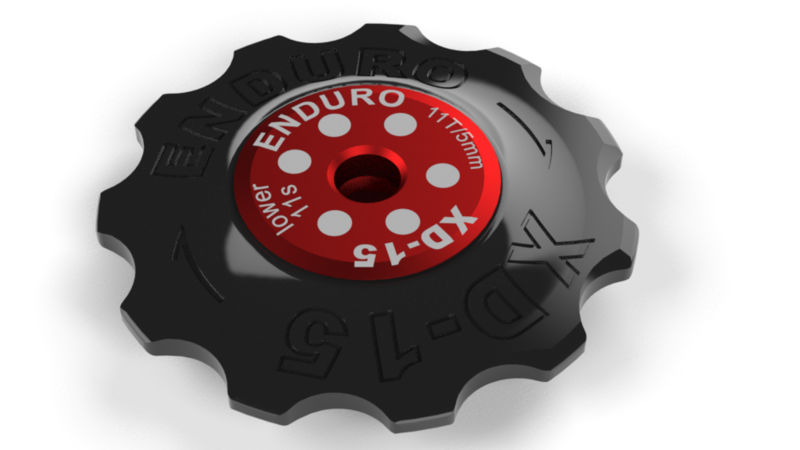 Not only 1 gram lighter each than the super light ZERO’s, these will outlast your derailleur’s lifespan! These pulleys will spin with the same speed years from now, thanks to our rust and corrosion-free XD-15 bearings. 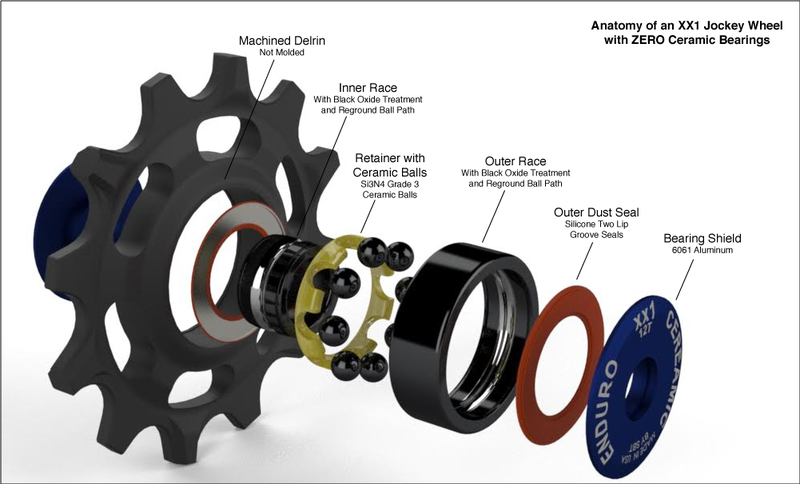 When installed with our XD-15 bottom bracket and XD-15 wheel kit, these complete the ultimate Enduro Bearings speed kit for your bike, reducing the overall friction to almost nothing. Independently tested and winning competitions for the least rolling resistance, the truly best part of these jockey wheels is the silent and crisp shifting they afford. Machined from solid Delrin at our California machine shop, not molded, they are much harder and precise than any competitor's that have copied this design. 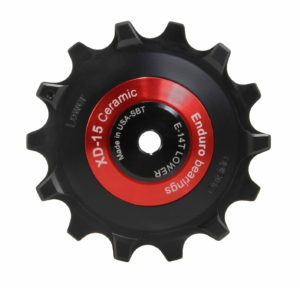 Where aluminum jockey wheels are loud and deteriorate almost immediately after installing, Enduro Bearings jockey wheels will shift perfectly and precisely a year or two from now just the same as the day you installed them. Machined from solid Delrin at our California machine shop, not molded, they are much harder and more precise than any competitor’s jockey wheels. 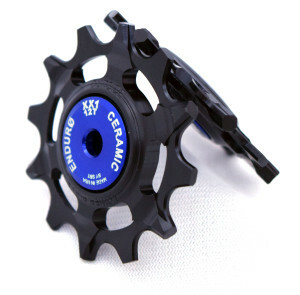 These are machined smooth for easy cleaning and highly recommended for cross competition or mountain bike usage. Of course they work perfectly for any Road application as well. Where aluminum jockey wheels are loud and deteriorate almost immediately after installing, Enduro Bearings jockey wheels will shift perfectly and precisely a year or two from now as the day you installed them. Created specifically with the SRAM XX1 drivetrain in mind, these jockey wheels are made of super hard, solid Delrin and machined to perfection at our California facility. The unique 12 tooth, narrow/wide design allows for extra precise chain retention. 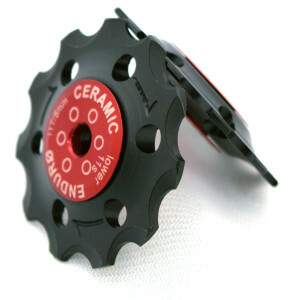 Zerø ceramic bearings ensure crisp, smooth shifting in all riding conditions. These pulleys can be used with all aftermarket chains.